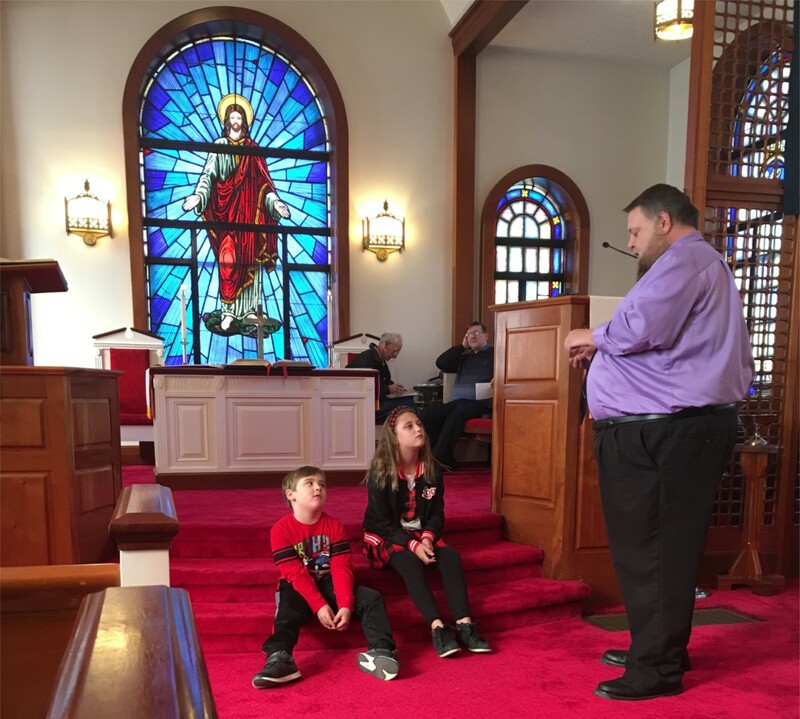 Jay Nunley speaks during Children’s Time with Jaelyn Blofsky and Zachary Rutledge at Gilbert Presbyterian Church in West Virginia. Many pastors have taken round-about ways to reach their calling. However, Jay Nunley may have one of the more unique paths to the pulpit, a journey that has happened quickly and that has also occurred in a rather unorthodox way. Jay is currently the lay pastor at Gilbert Presbyterian Church in Gilbert, WV. He has been preaching most Sundays there since his service of affirmation in late October. Jay does not preach on Sundays when there is communion because he’s not ordained. In fact, Jay has not spent one day in seminary (he’s not even a college graduate), nor has he completed CRE training. But despite the holes in his pastoral resume, Jay has made a strong connection with the people at Gilbert. Jay may be better known to those in the southern West Virginia town of Logan as the general manager of WVOW radio, hosting his own weekday-morning radio show called “What’s Your Opinion?” He became interested in radio at the age of 15 and went on to work specifically in rock and comedy circles. He was so good at his job, that after his junior year at Marshall University he accepted a lucrative job offer at a station in Charlotte, NC, as a 22-year-old. 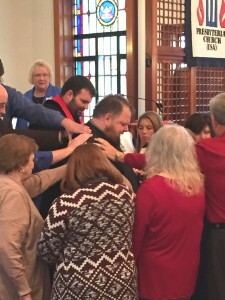 Jay Nunley receives the laying on of hands at his affirmation service in October 2017. Making a name for himself on the airwaves as “Big Poppa,” Jay bounced around the country, landing jobs in places like Chicago, IL; Tallahassee, FL; Hartford, CT; and Corpus Christi, TX; just to name a few. Jay will admit that during this time he was not close to God, and the death of a close friend to a drunk driver didn’t help his mindset. While growing up in Logan, Jay had been attending Hard Shell Baptist churches with his parents, but by the time he was in his early teens, his parents drifted away from going to church, and that was just fine with Jay who didn’t mind following suit. Jay’s parents would eventually find church again, landing at the First Presbyterian Church of Logan, WV. When Jay came home to visit, he would attend there with his parents, but it wasn’t something he felt drawn to. That changed in 2001 when Jay landed a job in Charleston, WV, and he began attending First Church of Logan more frequently. He recalled a sermon on Matthew 25 (“the least of my brothers and sisters”) by Murray Paige that, for Jay, “was like getting punched in the face.” It made him realize that there was a new direction his life needed to take. “That specific sermon, that specific moment, any doubts I still had, any leanings away from church or from religion in general that I had had just went away,” Jay recalled. “All of a sudden it hit me like a thunderbolt that all of this is true. Christ is king. Christ is the savior. I don’t have any merit. I stand justified through Christ. Oddly, the death of his sister to a brain aneurysm in the middle of the night helped Jay find the right path, which is interesting considering the loss of his close friend had the adverse effect. Jay remained active in his church for the past decade while continuing to do radio, both of which are in the small town of Logan. Then, just a few years ago, he felt another tugging that he couldn’t ignore. 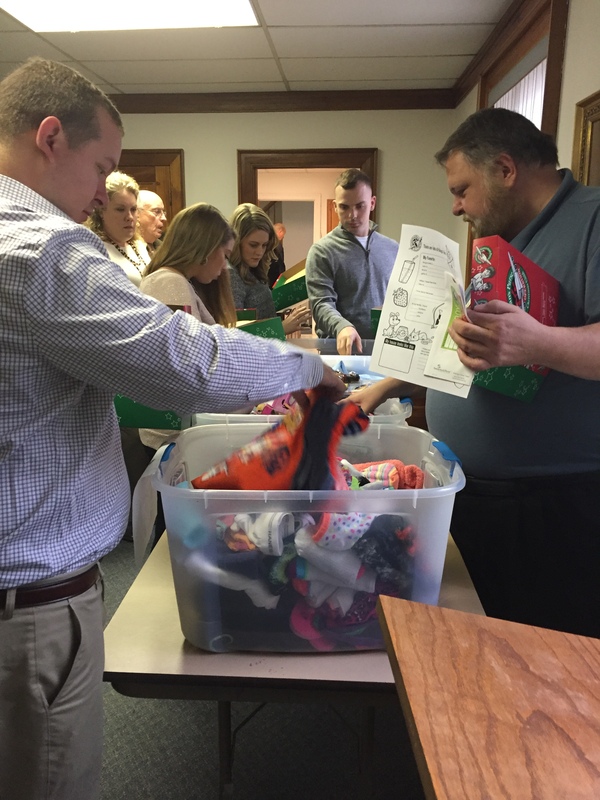 Jay Nunley, right, takes part in Gilbert’s Operation Christmas Child program. At the time, CRE Jim Musgrave was an interim serving at the First Church of Logan, and Jay went to him with what he was experiencing. Jim confirmed what Jay was feeling and urged him to follow that call. 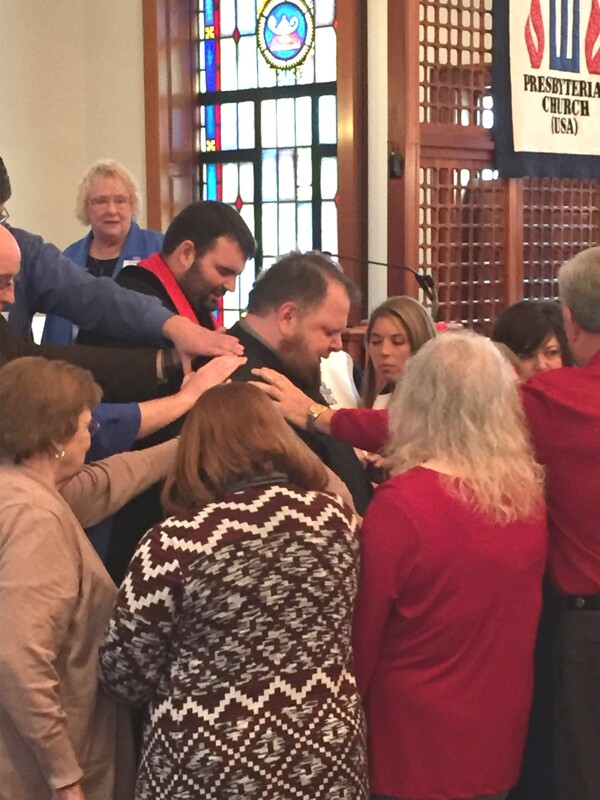 Jay eventually became an inquirer with the Presbytery of West Virginia, which allowed him to begin the steps to becoming a pastor. Eager to speak, Jay was permitted to preach for Jim at First Church of Logan on a fill-in basis, helping Jay to not only get his feet wet but also to allow others to hear his sermons. Jay continued to preach occasionally at First Church of Logan when he got a call from nearby Gilbert Presbyterian Church, which has not had a settled pastor for several years partly because it can’t afford a full-time one. Jay was asked to preach for that congregation in March of 2017, and the response was so positive that they wanted to keep him as their regular pastor. Jay continued to fill in open dates at Gilbert Church throughout the summer and it soon became clear a connection was being made. Gilbert Church made known that it wanted Jay to be its full-time pastor, but that simply wasn’t possible because of Jay’s lack of training and ordination. However, through an agreement with the Presbytery of West Virginia, Jay can preach three or four Sundays a month as a lay pastor, with the other Sunday when communion is served falling on the shoulders of someone else who can officiate the sacraments. The presbytery has also assigned Bill Hudson (pastor at First Presbyterian Church of Williamson, WV) to be Jay’s mentor, who, along with Kevin Geurink (pastor at First Presbyterian Church of Logan), meets weekly with Jay to study the lectionary and discuss pastoral practices. Jay, who recently landed on session at First Church of Logan, currently does all the pastoral visits for the sick and shut-ins at Gilbert and heads up some programming there. Because Jay still holds down his full-time job at the radio station, he won’t complete his college credits for his regents degree (one given to adults for work-life experiences) until the fall of 2018. And since he can’t go full-time to seminary, it could be many years until he is officially ordained. But Jay is committed to complete all the steps to make himself the best pastor for Gilbert Church that he can be.